I spotted this luna moth while returning from a walk in a nearby park. It was at the base of some landscape timbers, maybe having just eclosed. I coaxed it onto a finger and brought it home. I picked these grass blades as a perch and took a variety of photos. After dark I found a spot where I could get the nearly full moon in the photo. 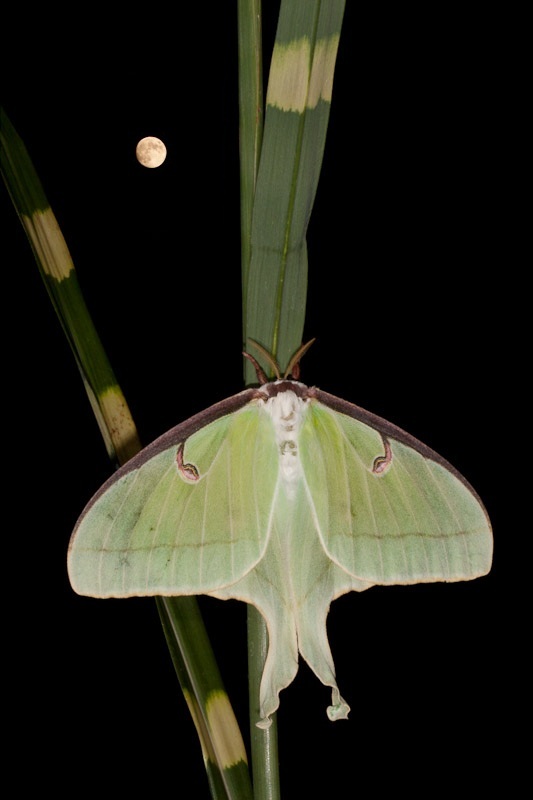 There’s no way to get both the moth and the moon in focus at the same time, so I simply took one photo with the moon in focus and another with the moth in focus, and then combined them digitally. Based on the antenna, I’d say this is a female. I left her outside on the grass and checked her a few times to see if a male had shown up. I never saw a male and she was gone the next morning.